When policymakers and industry leaders gather next week for the World Future Energy Summit in Abu Dhabi, they will celebrate a vision of what most of us want tomorrow's energy system to be: clean, sustainable and available to all. While I share this wish for our energy future, the path we are currently on is bleak -- and black. Nothing does a better job of exposing the widening gap between hope and reality than the annual coal market outlook we released a few weeks ago. Maria van der Hoeven is executive director of the International Energy Agency. The opinions expressed are her own. There is no denying the controversial reality of coal and its dominance in power generation worldwide. No fuel draws the same ire, particularly for its polluting qualities both locally and in terms of greenhouse gas emissions. And yet no fuel is as responsible for powering the economic growth that has pulled billions out of poverty. As we look to the long term, we must ask what role coal has to play -- because there will be a role. But failure to make coal a cleaner source of energy will have enormous and tragic consequences. 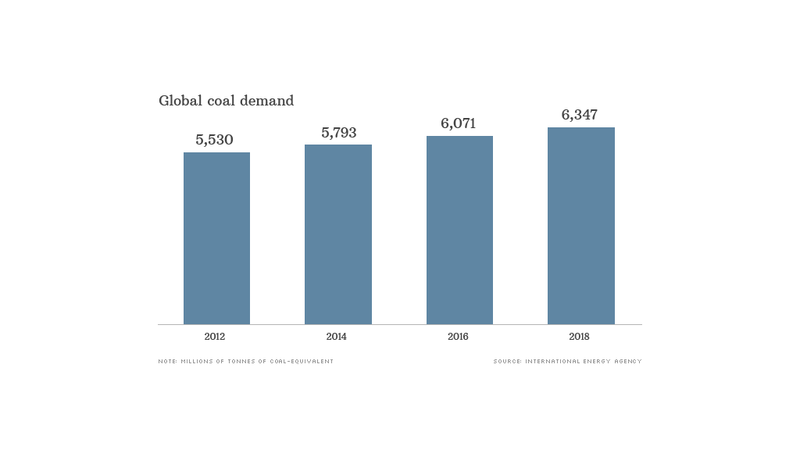 Fueled by seemingly insatiable demand in China and across Asia, coal use continues to soar. In the IEA's latest Medium-Term Coal Market Report, we project global demand for coal to rise by 2.3% per year, on average, until 2018. That may not seem like much, and it's slower growth than we've seen in recent years. But let me put that in perspective: Between now and 2018, global coal demand will increase by an amount greater than all of the coal that North and South America burned in 2012. Moreover, if current energy policies do not change, coal will overtake oil as the world's primary source of energy in the foreseeable future. This matters because a coal plant, once built, stays around for decades. This carries grave implications for climate change, for in its current form, coal is simply unsustainable. Coal-fired heat and power generation is the biggest single source of carbon dioxide (CO2) emissions resulting from fuel combustion today. More than 60% of the rise in global CO2 emissions since 2000 is due to the burning of coal to produce electricity and heat. And we should not overlook the health problems tied to local pollution produced by coal combustion. There are solutions to both the issues of local pollution and CO2 emissions. Underground coal gasification is a form of clean coal technology that can address the former. Some major countries have recently announced policies to encourage the construction and use of highly efficient coal-fired power plants and to promote technology that captures CO2 and buries it underground. We welcome these efforts as part of the broader push to clean up our energy system. Yet if nothing more than those emissions-reduction policy commitments and pledges announced to date are implemented, the long-term increase in average global temperatures will likely be well above the 2° Celsius ceiling agreed by governments. Radical action is needed to curb greenhouse gas emissions -- especially those from coal -- yet that radical action is disappointingly absent. Progress on capturing and storing carbon dixiode is effectively stalled, and a meaningful carbon price is missing. Moreover, even though we've known how to build efficient coal-fired power plants since the 1960s, most of the coal plants built since then -- and a large proportion of the ones being developed today -- are of the inefficient kind. When it comes to a sustainable energy profile, we are simply off track -- and coal is the elephant in the room. I take no pleasure in saying this, but if governments keep up their business-as-usual mindset then coal will play the biggest role in our energy future. Yet even if stronger policy action were taken now, coal will still be with us for a long time to come. The challenge, therefore, is to develop and implement technologies and policies to make it cleaner. I sincerely hope the leaders gathered in Abu Dhabi keep this in perspective as they seek solutions for tomorrow's energy.